Whether for just one job or for the whole Organisation, Inbucon can provide either a full Benchmark Report or quartile results in excel. By using our extensive salary and remuneration databases alongside our extensive library of published surveys, we provide information on all elements of the remuneration package from base, bonus and benefits. 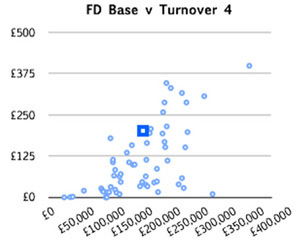 Your Organisation’s details such as current turnover and location. Base, bonus and benefit details for the chosen roles, in order for us to provide compa-ratios and commentary around the role. We then work with you to provide 3 or more datacuts that are relevant to your Organisation. We provide a compa-ratio to compare where your role is sitting within the current market and we can provide commentary and recommendations if desired. The 3 examples below show how data can be provided. 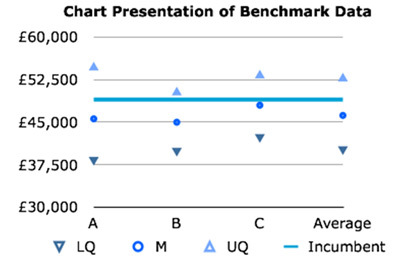 Please contact info@inbucon.co.uk to receive an example copy of a full Benchmark Report or quartile results in excel. Inbucon is an independent remuneration consulting business that prides itself on the delivery of practical, quality advice in a timely manner at a realistic price.